The US defense secretary James Mattis and the secretary General of NATO arrived at Kabul on an unannounced visit the other day. Upon arrival at Kabul, Taliban pounded Kabul airport with a series rocket strikes. Considering the time and place of this shocking attack which spanned for more than 6 hours, it was a response by Taliban challenging the new war strategy announced by the president of the United States of America. It is military protocol of foreign forces to not inform any Afghan party when key personalities such as James Mattis and Jens Stoltenberg plan unannounced visits however the Taliban still successfully managed to fish for such an important piece of information and planned accordingly for this significant military and diplomatic mission. As such, this attack not only challenged the abilities of American and other foreign forces based in Kabul but also shocked the US intelligence apparatus who were left scratching their heads as to how the Taliban managed to get a hold of critical piece of information about the arrival of the US defense secretary and secretary general of NATO. A. 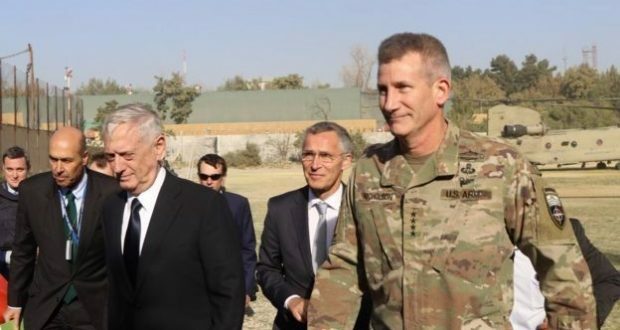 Even though the visit by James Mattis and Jens Stoltenberg were supposed to be secret and unannounced however the Taliban – in such a short period of time – managed to prepare and coordinate such a large attack to greet the new visitors that all the American and internal forces backed by airpower only managed to eliminate the threat after 6 hours!!! B. The Taliban managed to pull off their ‘guard of honor’ right under the nose of Arg, an area of the city that is supposedly under 24 hour camera surveillance of the Americans and hundreds of other intelligence agencies. C. The attack was so precise in its execution that the entire focus was on the military section of Kabul airport and civilians were kept out of harm’s way. Contrarily, the foreign and internal forces – who have had control of every inch of Kabul city for the past 16 years – were so thrown aback by the attack that they hit civilian homes instead of the target, resulting in a woman killed and 11 civilians injured. D. Although the attack was part of the urban tactics in guerilla warfare (hit and run) with a limited timeframe for execution however according to a journalist working with the New York Times, the attack lasted for nearly 6 hours where between 40 to 50 projectiles were lobbed at Kabul airport and all local and international flights were disrupted. The time chosen for this attack was such through which the Taliban forced international media to accept the effectiveness of their military and media because the attack was top news in all the important international media outlets and listed in twitter social media network as the third hashtag trending in the United States. The US defense secretary and secretary general of NATO are considered one of the most important officials and posts worldwide. Their trip to Kabul was not unexpected but they first visited India and then Kabul to elaborate on the critical points of the speech given by Donald Trump at the United Nations General Assembly and provide further details about their grand war strategy for South Asia and Afghanistan. They wanted to discuss the effectiveness of Trump’s strategy towards the Taliban with Ghani and implementation of its later stages. However Taliban sent their message first and practically showed them with military means the true scope of their reach and ineffectiveness of policy chosen by Trump. Another important point of this attack by the Taliban – which occurred close to the anniversary of conquest of Kabul by the Taliban twenty one years earlier – was to send Trump a message; if America toppled their regime through military intervention sixteen years prior, they too have the military strength to target the US defense secretary and secretary general of NATO in Afghanistan and force them to accept the ground realities despite them expending all their military might.